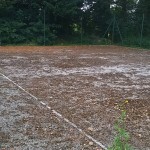 Existing outdoor sport facilities in the UK need to be kept well maintained otherwise it will shorten the life of the playing surface and it has been known for a tennis court renovation to be needed within the first three years of a surface being constructed because of lack of proper maintenance. 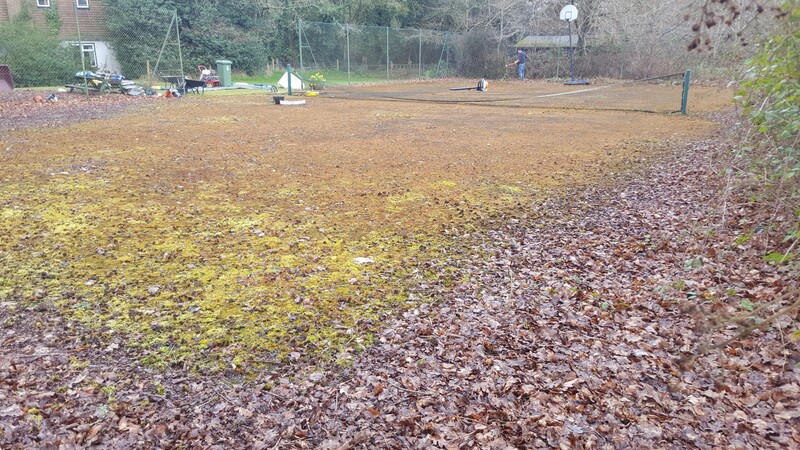 A sport surface refurbishment job is done when the existing facility needs more than a basic clean and paint because the existing flooring is starting to crack if it is a macadam hard court or contaminated sand on a synthetic turf surfacing specification. It’s important to tackle these issues as soon as possible to prevent them from getting worse and leading to the flooring needing a complete resurface. 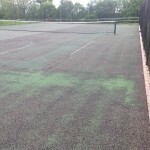 When synthetic turf courts get contaminated the dirty sand infill needs to be extracted and replaced with a new layer because otherwise porosity is affected on the court and the surface starts to get waterlogged. 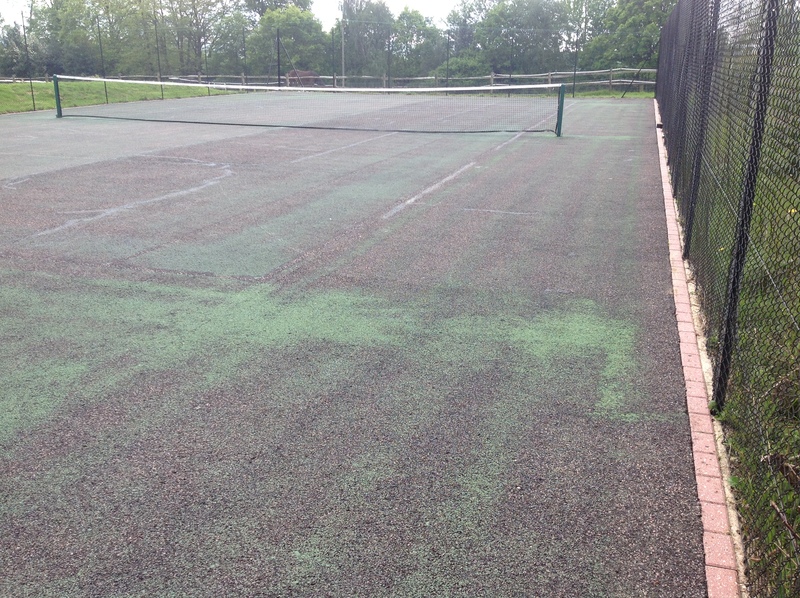 This problem occurs when the court isn’t regularly brushed and cleaned so the sand infill gets compacted and contaminated with moss and algae, so it’s important to clean the surface on a regular basis. 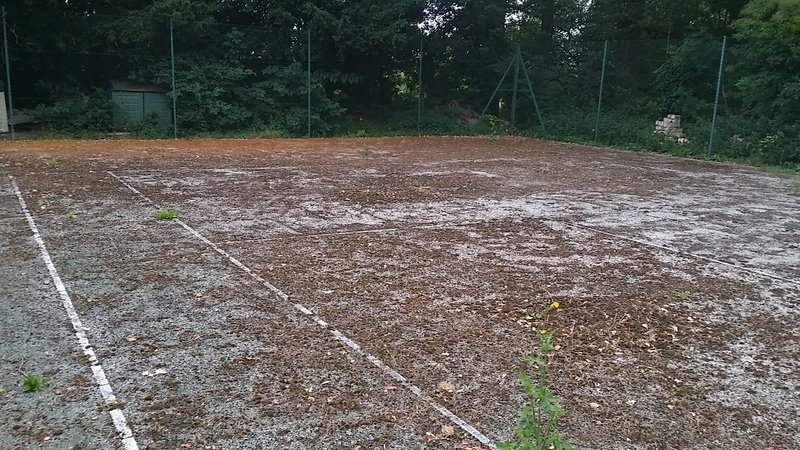 The process of completely replacing the sand infill is called rejuvenation and involves extracting the dirty sand and putting in a clean application which creates much better playing qualities and a safe environment. 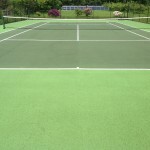 On hard surfaces sports court renovation is needed where the surfacing is starting to crack and develop fretting. The preferred method of repairing these areas is by installing a 2mm emerald stone mixed with polyurethane resin because this fills in the cracks well and when painted looks great. A new coating of anti slip acrylic paint can then be applied to the surface to enhance the performance qualities and create a safer surface for players. 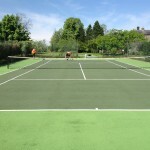 Click here to find out more about the tennis court painting that we can carry out – https://www.sportsandsafetysurfaces.co.uk/sports/tennis/painting/ and you can find out more details on our products and services. 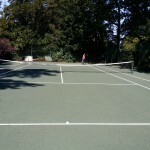 The costs of the tennis court renovation depend on the extent of repairs needed and obviously the sizes, dimensions and current state of the sports surfacing plays a factor into the costs and prices to the works being carried out but quotes can easily be submitted if you send in some existing photos and area size. 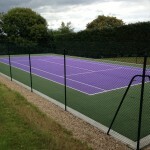 Something you need to bear in mind with the tennis court repair and painting costs is that the cheapest price isn’t always the best solution and you should always look at ‘best value’ because why spend thousands on renovating the existing facility and have this done again in a few years time. You need to check that the renovation includes a thorough professional clean, repair, binder coat installed and non slip paint applied with line marking. 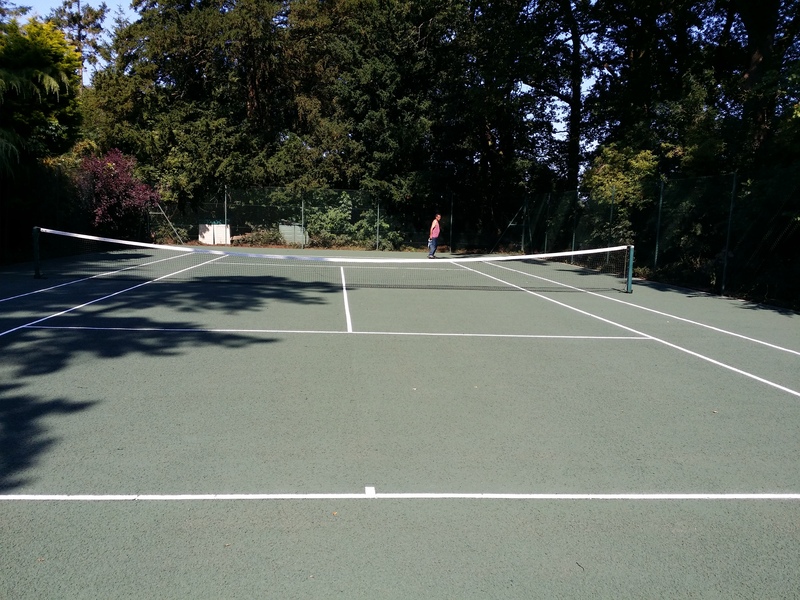 We can even create a design with multi use sports line marking to turn your tennis court into an all purpose facility which can be used for other games and activities. 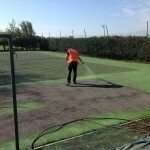 In this video above it outlines one of our recent projects which involved renovating a tennis court surface in Surrey. 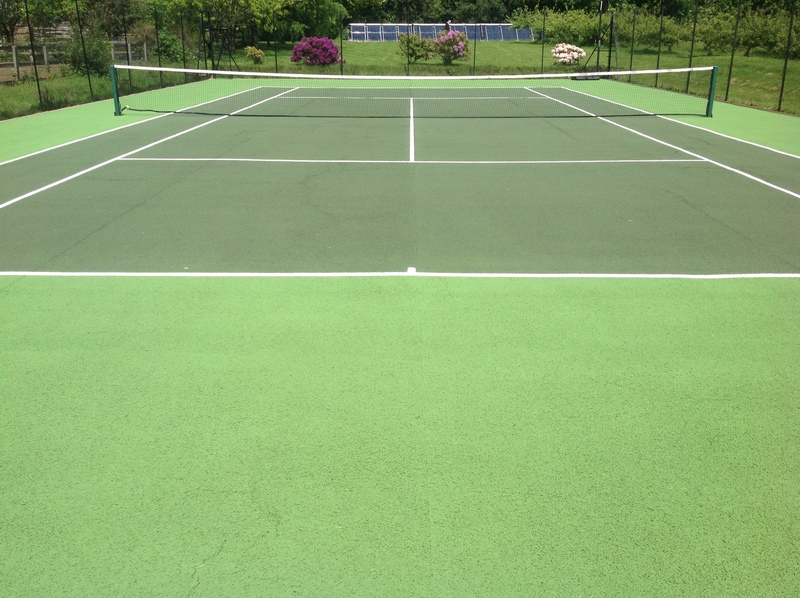 The macadam surfacing had become worn out and very dirty due to a lack of proper care, so we carried out a thorough clean with a pressure washer and applied a new coating of anti slip paint in a green two tone design with white line markings. The best way of checking the ‘best value’ sport surface refurbishment costs is by asking for previous case studies, how long the contractor have been established. A big one is to credit check the company because you want to know if something does go wrong they will still be trading so you can contact them to resolve any issues. We have worked on many projects throughout the UK for schools, leisure centres and individuals to install and maintain sports facilities. Our team always offer high quality services and ensure that every clients gets what they want. 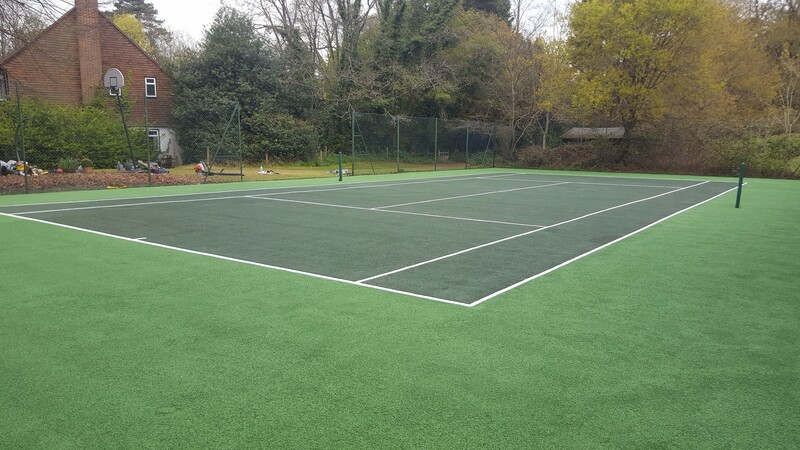 If you’d like an idea of costs for carrying out a tennis court renovation project for your outdoor sports facility, please contact us using our enquiry form and we’ll get back to you with some more details on designs and prices.